Metcalf Scholarships support outstanding undergraduate students to get their first taste of research. Metcalf scholars work within our leading research groups tackling important questions in cancer, immunology and infectious diseases. Metcalf Scholarships provide funding worth $6000 for undergraduates ($1000 paid to the student, $5000 paid to the lab for research costs). This scholarship is on top of the salary paid to undergraduate students at the Institute. Metcalf Scholarship winners also receive a commemorative medallion. The scholarships are made possible by the Metcalf Scholarship Fund, established in honour of beloved Institute researcher Professor Don Metcalf, who passed away in 2014. In 2019 nine Metcalf Scholarships will be awarded to applicants with the highest subject marks from their previous completed semester. Most Metcalf Scholars will commence their placement during the mid-year break, working in the lab ~8hrs/wk during semester (but not exam time) and full-time during vacations. Placements are expected to run for at least six months, but some students’ placements may last longer than this, as negotiated with the supervisor. Flexibility will be offered to students with carer or other employment commitments. Applications for the 2019 round close on Friday 22 March 2019. The scholarships will be presented at the Institute’s Annual General Meeting on 23 May 2019. Are in the second or third year of their undergraduate course (or equivalent for part-time or double degree students). First year students or students enrolled in an Honours year are not eligible. Have at least one full semester remaining at the time of application. Students in their final semester are not eligible. Are able to attend the Institute’s Annual General Meeting on 23 May 2019. Applicants for Metcalf Scholarships can, but do not need to, be current students at the Institute, and may receive support from other undergraduate schemes such as UROP. Scholarships will be awarded to applicants with the highest subject marks from the previous completed semester. Investigate the Institute’s research areas to identify your research interests and preferred supervisors. You may wish to contact supervisors directly to discuss potential research opportunities. You will be asked to indicate up to three preferred Institute supervisors – please note that the final placement will be dependent on supervisor availability. Please note that applications will not be accepted if supporting documents are not received by the closing date. Applications close Friday 22 March 2019. At the Walter and Eliza Hall Institute we strive to ensure all our staff and students enjoy a great working environment. We value diversity and gender equity in our work force and promote flexible working arrangements to balance working requirements and personal needs. 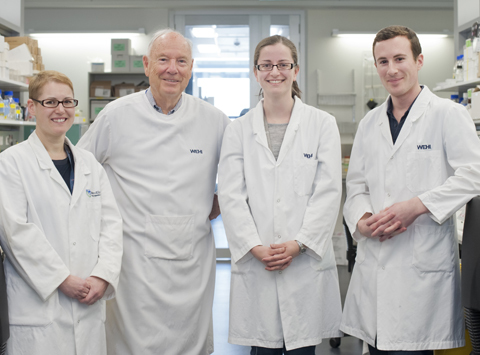 As a tribute to a scientist, known the world over as ‘the father of modern haematology’, the Metcalf Scholarship Fund has been established to support promising young researchers. Our inaugural Metcalf Scholars received scholarships to spend some of their undergraduate year working with research teams in the laboratory.